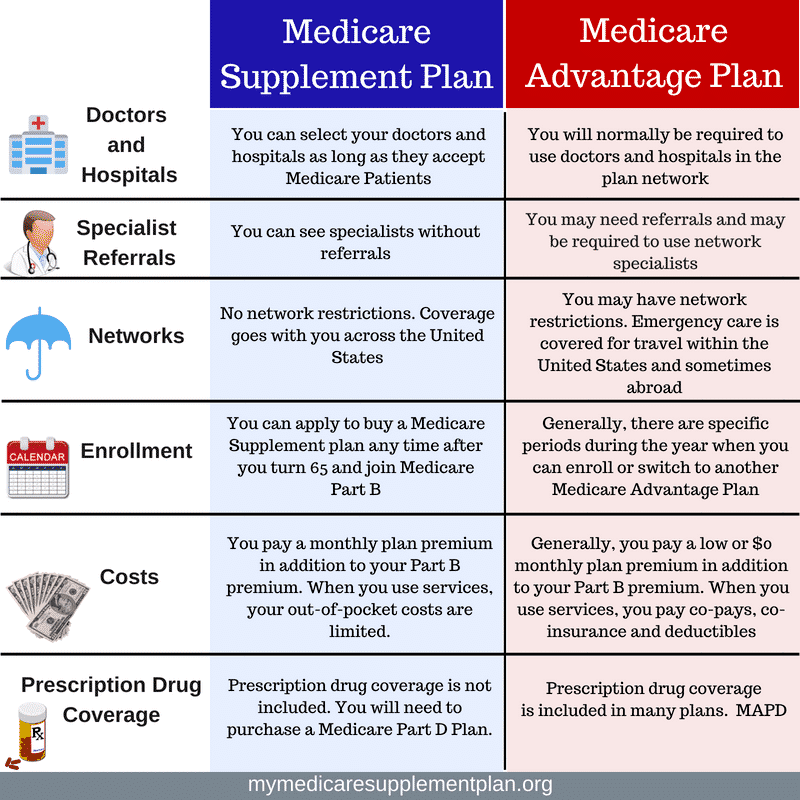 Medicare Advantage vs Medicare Supplement, there are two options generally used to either replace or supplement Original Medicare. One option is Medicare Supplement insurance (or Medigap) that works alongside your Original Medicare. The other option is purchasing a Medicare Advantage plan, which is an alternative way to get Original Medicare (also called Part C). For help understanding what plan fits your needs call us at 844-528-8688 and keep reading for details to help you decide. Although Original Medicare Part A and Part B pay for many health-care expenses, it will not cover all of them. Even with many covered health-care services, Medicare beneficiaries are still accountable for various copayments and deductibles, that can quickly add up. Additionally, Medicare Part A and Part B do not cover certain benefits, such as normal vision and dental, many prescription drugs, or overseas emergency health care. If you are relying only on Original Medicare, you’ll need to pay for these uncovered expenses out-of-pocket. Consequently, a lot of people that have Medicare typically enroll in two kinds of plans to provide coverage for these gaps in coverage, Medicare supplement plans or Medicare advantage plans. Medicare Advantage vs Medicare Supplement, these insurance plans have considerable differences when it comes to costs, benefits, and how they function. It’s critical to understand these differences while you review your Medicare coverage options. Here are some of the basics of Medicare Advantage vs Medicare Supplement, and we will go into more detail further on in this article. A Medicare Advantage plan is a private insurance company administering your Medicare benefits. You do not lose your Medicare Part A and Part B, but you will receive them from the Insurance company vs Medicare. Medicare Supplement insurance works with Original Medicare, Part A, and Part B, and will help pay for various costs that Original Medicare will not cover. These plans do not give stand-alone coverage; instead, you need to stay enrolled in Medicare Part A and Part B for your hospital and medical coverage. If you want prescription drug coverage, you have to purchase a Medicare Prescription Drug Plan (Part D) as well. When you purchase Medicare Supplement insurance (Medigap), you are still enrolled in Original Medicare, Part A, and Part B. Medicare pays for your health-care bills primarily, and then your Medigap plan covers particular cost-sharing expenses required by Original Medicare, such as copayments, coinsurance, or deductibles. Additionally, Medigap plans can also help with other expenses that Original Medicare will not cover, like Medicare Part B excess charges or emergency medical expenses when you are traveling outside the United States. Do not forget that Medicare Supplement insurance plans may only be used to pay for Original Medicare expenses; they cannot be used along with Medicare Advantage plans. Currently, there are ten Medicare Supplement insurance plans that are available in most states, and plan type is signified by a different letter of the alphabet,(for example, Plan A). The Medicare Supplement plan coverage is standardized throughout each plan letter, which means you’ll get the equivalent basic benefits for Medicare Supplement insurance coverage within the same letter category, regardless of which insurance company you purchase your plan from. Nevertheless, even if your basic benefits are equivalent across plans of the same letter category, the premiums may vary by insurance company and area where you live. If you live in Minnesota, Wisconsin, or Massachusetts, keep in mind that these states standardize Medicare Supplements plans differently than the rest of the country. Medicare supplement plans cover out-of-pocket expenses that are not covered by Original Medicare, like copayments, coinsurance, and deductibles. Some Medicare Supplement plans may possibly help pay for other benefits that Original Medicare doesn’t pay for, such as emergency health services outside of the U.S. or the first three pints of blood. Medigap plans do not include prescription drug benefits. If you do not currently have creditable prescription drug coverage, you should think about purchasing a stand-alone Medicare Part D Prescription Drug Plan to pay for the costs of your prescription drugs. Additionally, Medicare Supplement insurance plans typically do not offer extra benefits like regular dental, vision, or hearing coverage beyond what’s covered by Original Medicare. Private insurance providers have a little bit more flexibility in developing Medicare Advantage plans, so you’ll find considerably more differences between plans. This indicates that you need to be even more careful examining plan options to make certain you don’t miss anything. As previously mentioned, Medicare Advantage plans provide you the ability to have coverage for benefits over and above Original Medicare. This will likely include regular vision and dental, hearing, and health wellness services. Typically, under Original Medicare, you would have to pay for these features out of pocket if you don't have you have other health insurance. Another feature of Medicare Part C (Medicare Advantage) is that many of the plans also include prescription drug coverage as part of the plan's core coverage. Also referred to as Medicare Advantage Prescription Drug plans or MAPD, these plans give you the advantage of having all of your Medicare benefits implemented through a singular plan. If you choose to enroll in a Medicare Advantage Prescription Drug plan, you won't have to purchase an additional Medicare Prescription Drug Plan. In reality, if you are enrolled in a Medicare Advantage plan that contains prescription drug coverage and you are also enrolled in a stand-alone Part D Plan, you would likely be dis-enrolled from your Medicare Advantage plan. When it comes to health care, every individual’s circumstances are different. Knowing this, it’s vitally important to consider both Medicare Supplement Insurance and Medicare Advantage Plans to make an informed decision about which plan will be the best solution for your health care costs and needs. Call us anytime for help in choosing which plan fits your needs, 844-528-8688 or send us a message from our contact us page.